Under the editorship of Richard Bowler, Professional Motor Mechanic is unsurpassed in its comprehensive coverage of issues that really matter to the automotive trade. In a style tailored to directly suit the demands of the busy workshop or bodyshop technician, it is an invaluable information source for a small to medium sized business. Regular monthly features include news, views and all the latest product information as well as technical clinics, tips and advice. 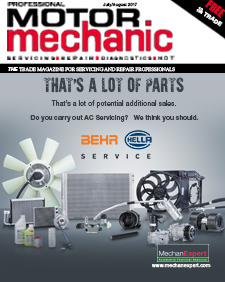 Split into a number of regular and dedicated features, the 11 issues per year cover a host of areas including diagnostics, brakes and clutches, vehicle repair and refinishing, training, air conditioning, health and safety, remanufacturing and much more. There is also incisive business management editorial on marketing, customer service, legislation and new opportunities. Please fill in the form below to register your interest.